The Quick Connect System Fittings are made from Glass-filled Polypropylene and the piping is made from Polyethylene. They can be used to install additional outlets or to completely re-plumb a boat or recreational vehicle. Whale Quick Connect fittings ensure a high integrity, reliable plumbing system solution, specifically designed for use in marine applications and most require no tools for connections. Whale Quick Connect fittings offer many benefits, all ensuring a high integrity plumbing system. Note: It is vital that Whale Quick Connect water systems are fully winterized to prevent frost damage in cold weather climates. Standard Whale 15mm Tubing is made from medium density polyethylene, and the WhaleX is made from high-density polyethylene. They both have the same temperature and pressure rating for sustained use, but we test the Whalex tubing to withstand 3x its rated pressure (2x for the standard tubing). 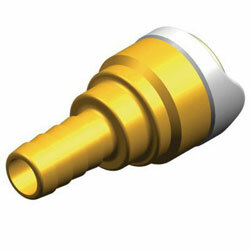 The most common BSP thread has parallel sides, unlike the tapered sides of the common NPT thread. These threads are commonly found at the end of flexible connection tubes from faucets. The most commonly found size is 1/2 ", although 3/8" is also common. BSP threads seal on a washer, and do not require sealant on the threads.